Kings XI Punjab is all set to take on Mumbai Indians on Saturday, March 30, 2019, at Punjab Cricket Association IS Bindra Stadium, Mohali. 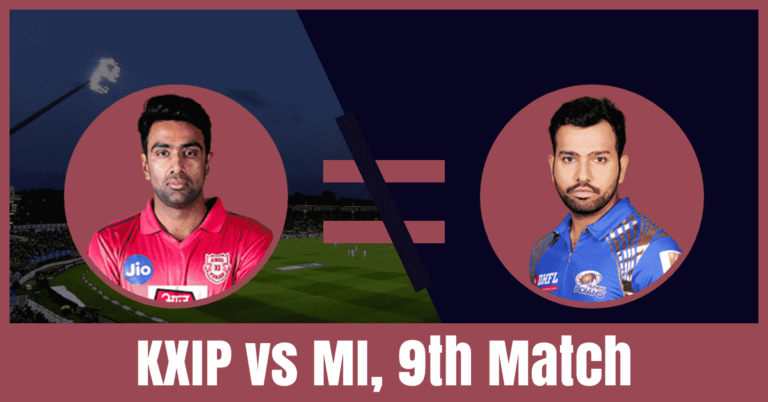 If you are looking for KXIP vs MI Dream11 Fantasy Cricket Match Prediction, 9th match then you are at the right place. If you want to know the weather report of Mohali, Dream11 free teams, the best choice for captain and vice-captain, MI vs KXIP full squad then you are at the right place. we have covered all the above details. You just need to read the complete post so that your winning chance increases to 100%. Make sure to make your own team. All the statistics and information are very much accurate and taken from very reliable sources. You can use the data and statistics to make teams in any fantasy cricket leagues like Dream11, Myteam11, 11wickets and many more. Kings XI Punjab started their 2019 IPL by winning their first match but they failed to repeat the result against KKR. They have played 2 matches, won one and lost one game. They are in the fifth position of the points table with two points in the pocket. Chris Gayle, Mayank Agarwal, Sarfaraz Khan and David Miller are the top scorers of Punjab team. They have scored 99, 80, 59 and 59 runs. Mujeeb Zadran and AJ Tye are the top wicket-takers. They have taken 2 and 1 wickets respectively. On the other hand, Mumbai Indians lost their first match of the season but won their last against RCB. They have played two games, won one and lost one. They are in the sixth position of the points table with 2 points in their wallet. Yuvraj Singh, Rohit Sharma, Quinton de Kock and Suryakumar Yadav are the top scorers of Mumbai. They have scored 76, 62, 50 and 40 runs. JJ Bumrah and MJ McClenaghan are the top wicket-takers. They have taken 4 and 3 wickets respectively. Quinton de Kock, Rohit Sharma, Suryakumar Yadav, Hardik Pandya and Jasprit Bumrah are the key players of Mumbai Indians Team. Rohit Sharma will lead the MI team. The MUM team management may decide to play with the same playing 11. Quinton de Kock, Rohit Sharma and Suryakumar Yadav will lead the batting department. Krunal Pandya and Hardik Pandya will play as a key all-rounder. Mitchell McClenaghan, Lasith Malinga and Jasprit Bumrah will lead the bowling department. Hardik Pandya and Rohit Sharma are the most valuable players of Mumbai Indians team. Wicket Keeper: Quinton de Kock. Batsmen: Rohit Sharma, Yuvraj Singh, Suryakumar Yadav, Kieron Pollard. All-Rounders: Hardik Pandya, Krunal Pandya. Bowlers: Mitchell McClenaghan, Jasprit Bumrah, Mayank Markande, Lasith Malinga. Rohit Sharma(c), Quinton de Kock(w), Evin Lewis, Suryakumar Yadav, Ishan Kishan, Yuvraj Singh, Aditya Tare, Siddhesh Lad, Kieron Pollard, Pankaj Jaiswal, Alzarri Joseph, Hardik Pandya, Rahul Chahar, Krunal Pandya, Barinder Sran, Mitchell McClenaghan, Anmolpreet Singh, Mayank Markande, Anukul Roy, Jasprit Bumrah, Jason Behrendorff, Lasith Malinga, Rasikh Salam, Ben Cutting, Jayant Yadav.